Hopelessly left to throw away your damaged food items; you think about what’s your best option to repair your home refrigerator. Going with the normal trend, you think of Doing-It-Yourself. But then it strikes you in the mind that what if you ruin it more and unnecessarily have to pay more money for its replacement! THAT’S THE LAST THING YOU WANT! And honestly speaking, you don’t have to take such a HUGE RISK. WHY? Because you have professionals offering quality fridge repairs in Campbeltown willing to fix your fridge effectively. Another good reason which needs mentioning is that these experts also help you SAVE A LOT OF MONEY. Think it’s Far-Fetched? Read the post below! Quality Repair at THE FIRST INSTANCE: That’s right! These professionals possess the expertise to handle all fridge issues and using that knowledge; they will get it done it at one-shot. They also adhere to all industry safety standards (that could happen due to electrical shocks, muscle straining or even burns). Admit it; you cannot fix your fridge in the first instance. Plus, there’s always a greater probability of you getting injured badly (even ending up in the hospital). All this will mean more money expense and more agony to deal with. 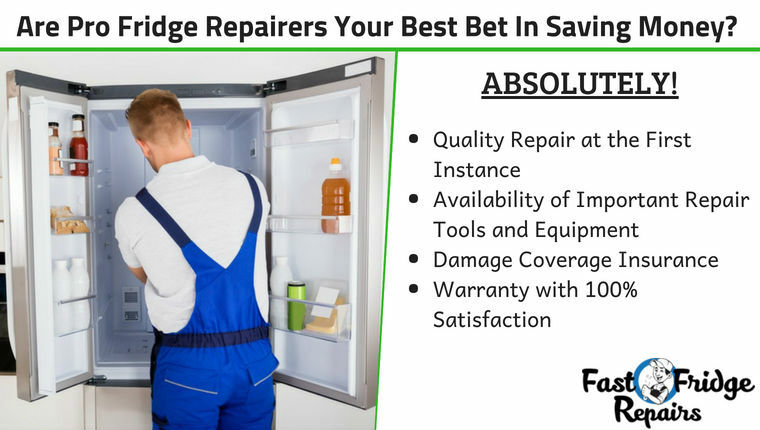 Availability of Important Repair Tools and Equipment: They are called experts, not just because of their ability to resolve any fridge issues but also because they possess all the right tools of their trade. That allows them to tend to your damaged unit properly and fix it immaculately. What’s more; before starting to work on your damaged fridge unit, these pros will conduct a comprehensive inspection. They will check every inch of your unit to isolate the issue. And depending on the damage, they determine the approach that’s best suited for its repair. DIY will make you buy all the repairing tools from the market (and because you aren’t sure of what you need, you may still not get all the right ones anyway). This means you are spending on something that you are unsure and if you do miss out on a specific repair tool, you will need to Go Again and Spend Again. In comparison, hiring pro repairers seems a much saner option. You save time, you put less effort, and importantly you put your money to the right use. Damage Coverage Insurance: The biggest perk of having specialists who provide fridge repairs in Blacktown is they provide you with damage coverage insurance; if something unfortunate happens when repairing your unit. Accidents are uncontrolled and can happen with the best in the business. To ensure that you don’t have to bear the damage costs from their end, these professionals have their insurances as a life-line. Never will the top-rated companies make you pay more than necessary. And that’s another way by which these pros help you save money. Warranty with 100% Satisfaction: Last, but not the least, these professionals also vouchsafe 100% satisfaction in their services. Yes, they do it with their immaculate repair work. But along with that they even promise you charge-free repairs if your unit sees the same issue again. Most top-rated companies offer you a 1-year warranty on their services, hence allowing you to save more of your hard-earned money. If you have a fridge which is not working properly, speak to these experts and guarantee savings. To get a head start, you can speak to the experts of “Fast Fridge Repairs” and even seek price quotes.